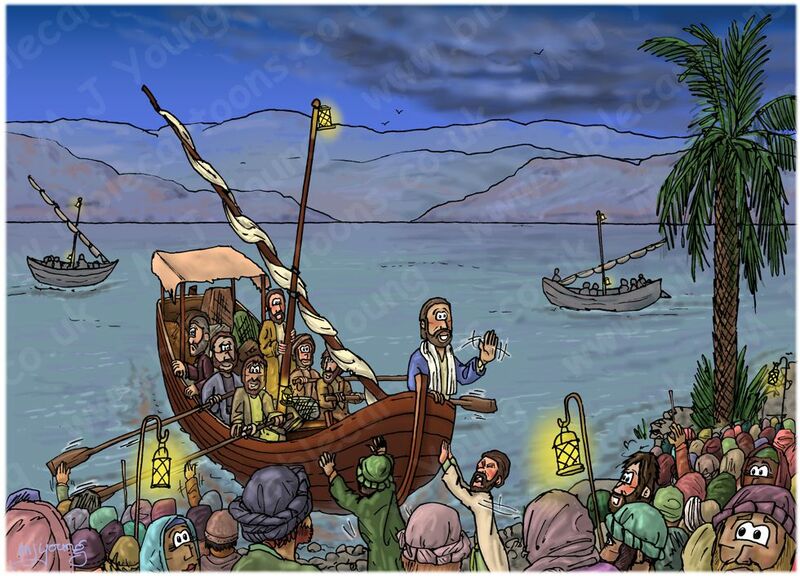 35 As evening came, Jesus said to his disciples, “Let’s cross to the other side of the lake.” 36 So they took Jesus in the boat and started out, leaving the crowds behind (although other boats followed). The low evening sun is producing shadows on the right hand side of people and objects in this scene. which is low over the lake. Various lanterns on poles, and on the masts of the boats also illuminates the scene. Jesus is in the front of the boat, waving to the crowds on the shore. The disciples are making ready in the boat to row out onto the lake. Matthew (also called Levi) is kneeling down and looking worriedly over the side of the boat. I tend to show Matthew/Levi looking green from seasickness in these boating scenes on the lake! In front of Matthew is Andrew, with James (son of Zebedee & brother of John) in front of him. Both are readying oars. 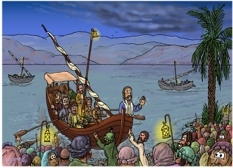 On the other side of the boat, from the back to the front are two unnamed disciples, one standing by the mast, the other with an oar in his hands. In front of them is John (son of Zebedee & brother of James). Having drawn Mark 04 – Jesus calms storm – Scene 03 – Jesus sleeps (both versions) some years ago, I now feel I ought to keep the same number of people in the boat, for the sake of continuity. One of the men pushing the boat out onto the lake from the shore (the one with an expression of straining) is the unnamed disciple who is hugging the mast in Scene 3! I found some photo’s on the internet of the lake shore, which I have used for reference. I’ve added a palm tree. Don’t forget that the lake is fresh water, not sea water, so plants would grow all around the shore line. I enjoyed adding the lanterns, which help to define the scene as being in the evening.